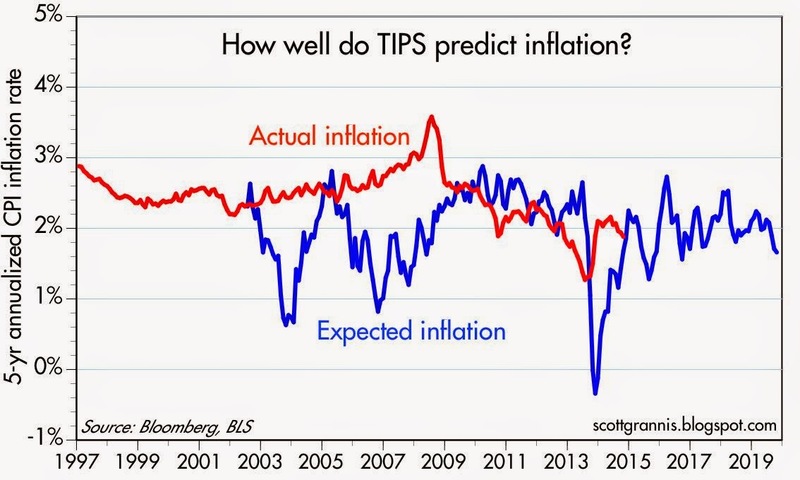 How well do TIPS predict inflation? In my view, one of the most enduring and extraordinary features of the current business cycle expansion has been the strength of corporate profits. According to the GDP stats released yesterday, third quarter after-tax corporate profits hit a new nominal high of $1.87 trillion, and a new high relative to GDP of 10.3%. So it's no wonder that equities are hitting new highs. 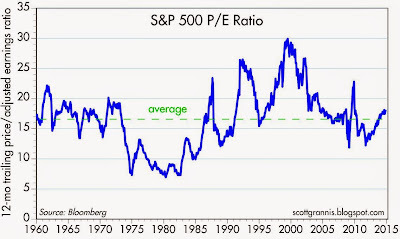 Indeed, despite profits hitting all-time record highs, PE ratios today are only slightly above average. Stocks by this measure still look quite attractive. From 1958 through 2004, after-tax corporate profits averaged about 5.3% of GDP. Since then, and including the profits collapse of the Great Recession, after-tax corporate profits have averaged 8.8% of GDP. 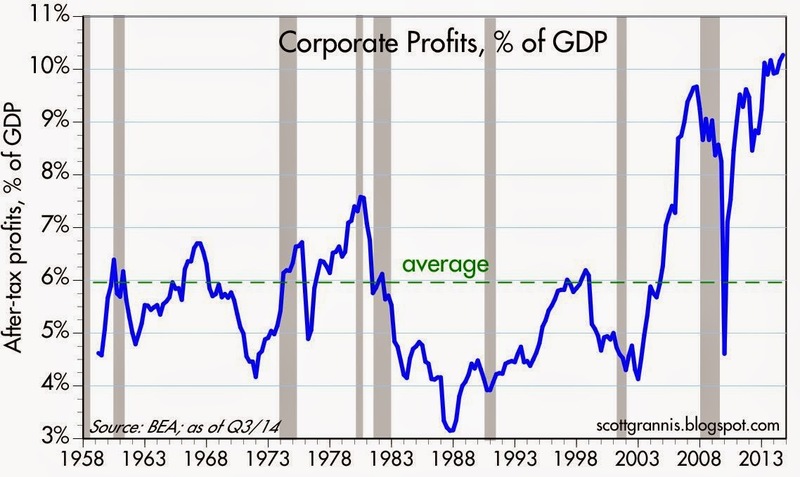 As the chart above shows, over the entire period since 1958, corporate profits have averaged about 6% of GDP. For the past 5 years, equity bears have in effect argued that profits were unsustainably high because they had a strong tendency to be mean-reverting to, say, 6% of GDP. Instead, profits have just continued to grow, both nominally and relative to GDP. A pessimistic outlook for corporate profits has essentially been the driving force behind the equity market's gains, because profits have far exceeded expectations. In a sense, the market has been forced higher because profits have been much stronger than expected. 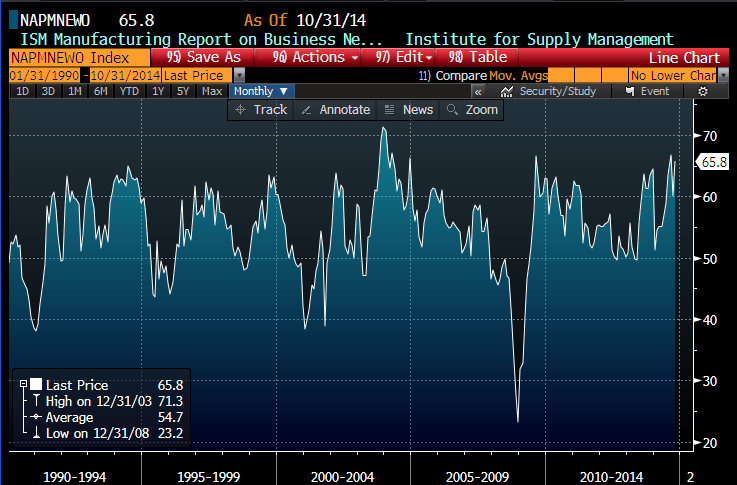 Global profit margins haven't budged for over 10 years. What's happened is that world GDP has grown much faster than U.S. GDP, and U.S. corporations have cashed in on the boom. Today, a greater portion of corporate profits is coming from overseas, where markets and opportunities are much more dynamic than here at home. Apple can sell iPhones to billions of customers all over the world today, whereas it could only address a much more limited market in the past—primarily the developed countries. Seen from this perspective, there is much less reason to worry about stagnant or declining profits. But perhaps I'm mixing apples and oranges here, because my source for corporate profits in the first chart in this post is the National Income and Products Accounts (i.e., the GDP stats), instead of the more-commonly referenced reported (GAAP) earnings. 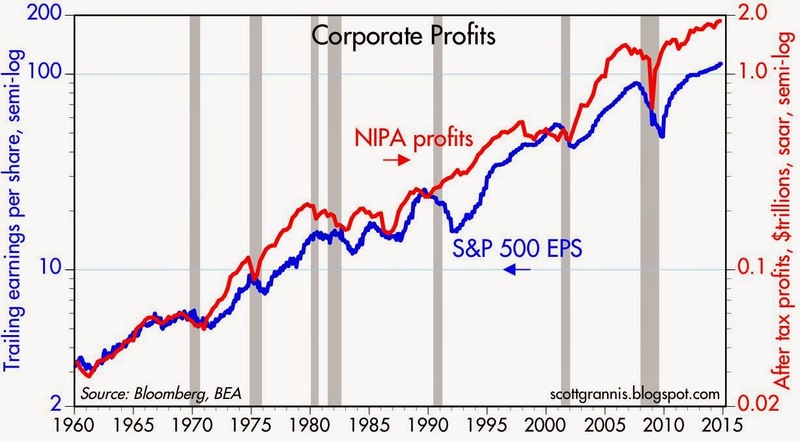 As the chart above shows, after-tax corporate profits according to NIPA data have been much stronger over the past decade than profits reported according to GAAP data. I addressed a few reasons for the difference in the behavior of these two measures of profits in a post last year (i.e., changes in accounting standards and changes in taxation regimes). Moreover, NIPA profits are derived from corporate tax returns filed with the IRS, and as such are not impacted by things like "goodwill." Regardless, as the chart above shows, earnings by either measure have been increasing fairly steadily over the past five years, and both are at new highs. Let's stipulate for the sake of argument that GAAP earnings are what everyone focuses on, and they are the better measure to use when valuing equities. 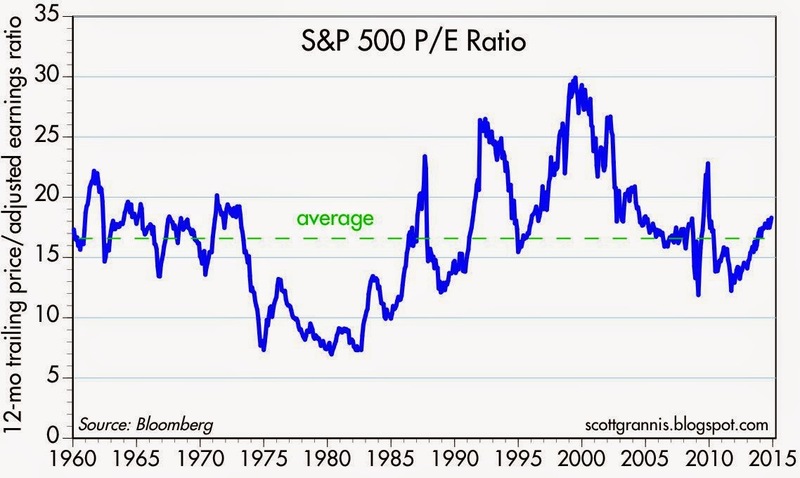 What we get is the chart above, which calculates the PE ratio of the S&P 500. Today it is 18.3, which is only slightly higher than its long-term average of 16.2. If earnings are at new nominal and relative highs, and multiples are only moderately above average, that hardly supports the case that equities are overvalued, as the bears currently believe. 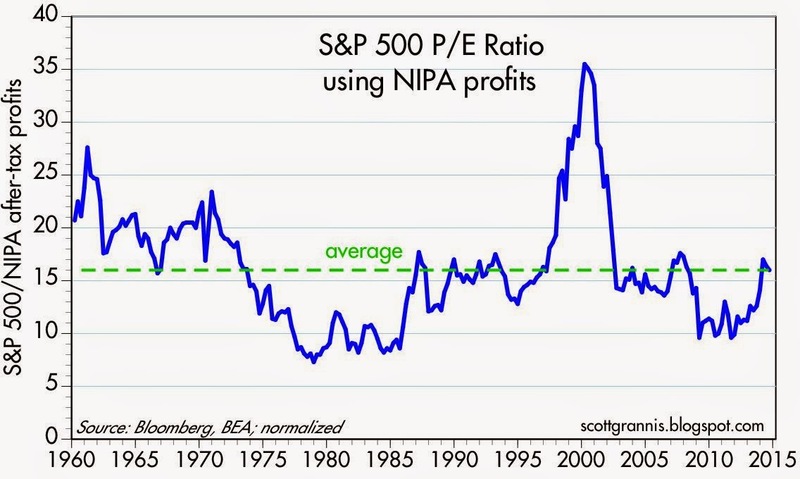 In the chart above I've used NIPA profits instead of GAAP profits to calculate the PE ratio of the S&P 500. (I've normalized the results so that the long-term average is 16, so that it can be compared easily to the prior chart.) Here we see that equity multiples at the end of the third quarter were about average. The real equity market bubble happened in the late 1990s, but it was thoroughly popped. Another way to value equities is to compare their earnings yield (earnings per share divided by share price—the inverse of the PE ratio) to the yield on risk-free Treasuries. That's shown in the chart above. 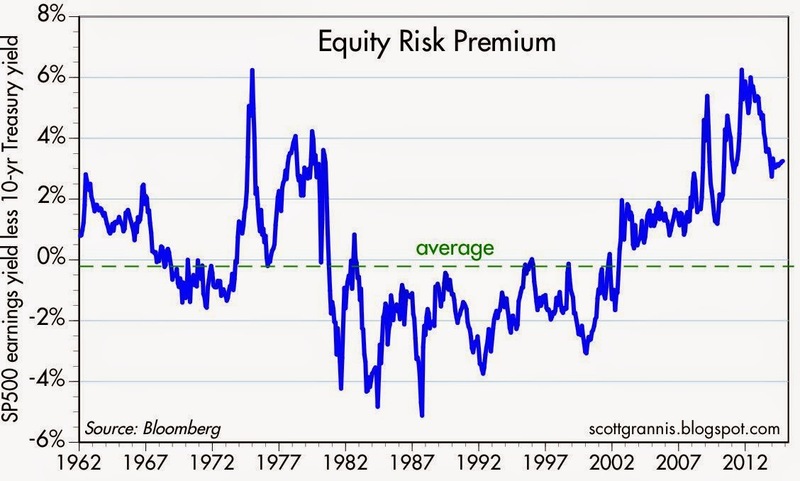 Although the current equity risk premium is a lot lower than it was several years ago, it is still substantially higher than its long-term average. In order to remain indifferent between holding equities or holding 10-yr Treasuries, investors today are demanding a yield that is more than 300 bps higher than the yield on 10-yr Treasuries. That's solid evidence that the market is still quite risk-averse. In the heady growth days of the 1980s, stocks were so in demand that investors were content to accept an earnings yield that was much lower than the yield on 10-yr Treasuries. If investors were enthusiastic about the outlook for earnings today, earnings yields would be lower relative to Treasury yields. Yet another comparison that is instructive: comparing the ratio of the S&P 500 index to GDP, and that ratio to the inverse of the level of 10-yr Treasury yields, as shown in the chart above. 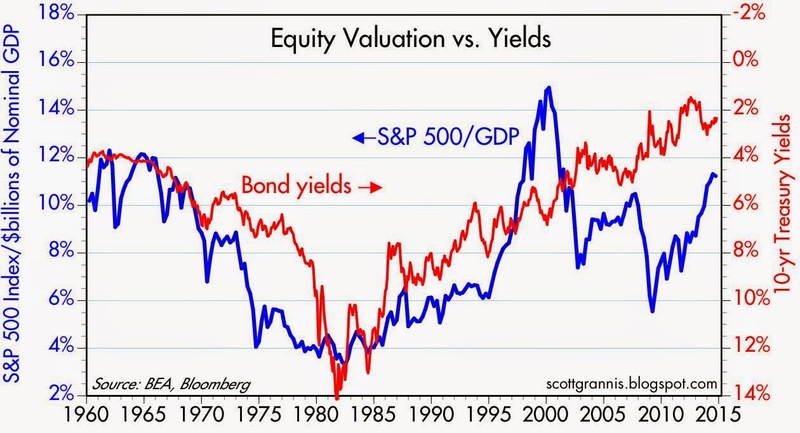 That the two lines tend to move together is a sign that equity valuations tend to be higher as yields are lower, and vice versa. This fits with the theory that equity prices are the discounted present value of future earnings, so lower discount rates (i.e., Treasury yields) imply higher equity valuations. As the chart suggests, equity pricing is not out of line with Treasury yields. If anything, prices could be higher still. Alternatively, this could be taken as a sign that equities today are priced to the expectation that Treasury yields will move substantially higher (i.e., the market is priced to bad news). Conclusion: there is still a lot of risk aversion to be found in the pricing of Treasuries and equities. This is a good sign that the equity market is not over-valued and may still be attractive. Update: Quantitative Easing didn't "lift" the stock market; strong corporate profits did—that's a big difference for one's world view. Last April I wrote a post about the problems with Piketty's book, Capital in the Twenty-First Century. Over the weekend I read Deirdre McCloskey's 55-page tour de force review of the book. It's far more than just a critique or a review of the book, it's an education in economics and a dazzling collection of references and observations on politics, society, and economic history. It's densely written, however, so it will require several hours of effort, but I think you'll find it worthwhile. One popular meme these days is "the global economy is slowing down." China's economy has slowed from double digit growth rates to 7%, Japan has suffered two quarters of negative GDP growth, and the Eurozone economy has grown by less than 1% in the past year. The U.S. economy has barely managed to exceed 2% annual growth for the past five years, and people worry about the future since the Fed seems almost certain to begin raising interest rates within the next 3-6 months. Industrial commodity prices are down almost 10% in the past six months, and oil prices have plunged almost 30% since last June—all (supposedly) signs of weaker demand. Moreover, high-yield credit spreads have risen over 140 bps since June, reflecting a loss of confidence in the future of corporate profits. To make matters worse, policymakers seem to have run out of options. Short-term interest rates are near the zero bound in Europe, Japan, and the U.S. Quantitative easing hasn't done much at all to stimulate the U.S. economy, and it's unlikely to be a miracle cure for the Eurozone economy. The Bank of Japan has managed to ease by enough to push the yen down by almost one-third against the dollar, but a hike in Japan's sales tax seems to have swamped any stimulus from stronger exports. Genuine stimulus (e.g., tax reform, tax cuts, and reduced regulatory burdens) is being discussed almost everywhere, but it's not likely to happen any time soon. A lot of people are probably thinking "If policy can't stimulate, and demand is weakening on the margin, it's time to really start worrying." I'm not so sure it's time to run for cover. One of the most remarkable turnarounds in the global economy in recent years is shown in the chart above. 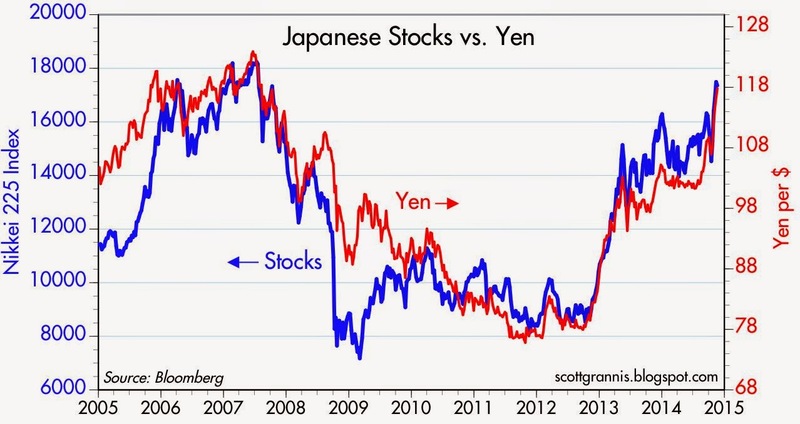 In the past two years, the yen has plunged against the dollar, and the value of Japanese equities has doubled, both in seeming lockstep. Even in dollar terms, the Nikkei 225 is up over 30% in the past two years. It's hard to deny that something big is going on here, even though the Japanese economy shrunk in the six months ending September. Have you noticed that no one seems to be talking about the "wealth effect" anymore? That's the theory that says an increase in stock prices and/or housing prices can induce consumers to spend more because they have become wealthier. That increased spending has the effect of strengthening the economy, or so the theory goes. That's never made much sense to supply-siders, however. You can't spend your way to prosperity. Prosperity only comes as a result of more work, more investment, and/or more risk taking. The "wealth effect" theory assumes that stock prices just happen, or that they can be pushed up by easy money. In turn, higher stock prices cause more spending, which grows the economy and validates the higher stock prices. Not so, in supply side theory. The stock market, like the bond market, is difficult to fool. Easy money doesn't just magically raise stock prices, and higher stock prices don't then stimulate the economy. More likely, stock prices rise as a result of improving economic and financial market fundamentals. Higher stock prices discount rising future earnings. Stock prices are the barometer of the economy's future health, not a by-product of easy money. So consider the implications of the chart above. 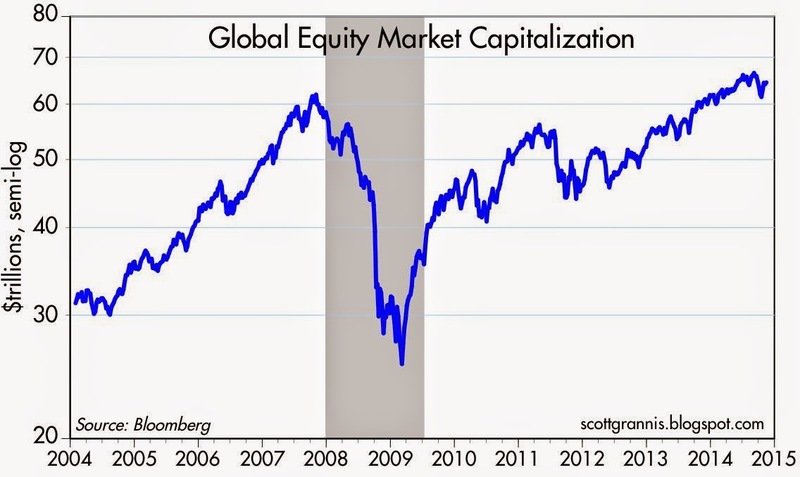 It shows that the market capitalization of the world's equity markets has increased over $40 trillion dollars since March 2009, and in the past two years the value of global equities is up about 30%. That's a huge, and welcome increase. Does it mean that consumers are going to be spending double and triple as much because stock prices have almost tripled? No. It means that the expected future cash flows of corporations all over the globe have increased significantly. Consumers likely will be spending more in the future, but only because corporations will be making more and better stuff, hiring more workers, building new plant and equipment, and booking rising profits. The stock market is often able to look across the valley of despair and see a better future on the other side. It's likely that that's the case today. 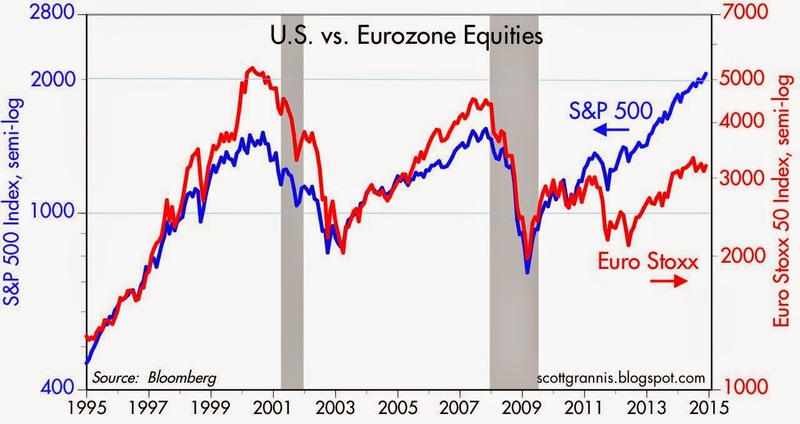 As the chart above shows, U.S. equities have greatly outpaced their Eurozone counterparts in the past four years. Well, yes, we know that the U.S. economy has been much stronger and more dynamic than the Eurozone economy—that's not a surprise. But conditions in the Eurozone have nevertheless improved. In the two years since Japan's equity market suddenly came to life, U.S. equities are up almost 50%, and Eurozone stocks are up a little over 30%. In dollar terms, Eurozone equities are up about 20%. That's not chickenfeed. It's hard to get pessimistic about the future when the world's stock markets are becoming more and more optimistic. Of course, it's hard to see significant improvements anywhere right now, but in my experience it sometimes takes awhile before the average person realizes the extent to which economic conditions have actually improved. For now, the world's stock markets are seeing better times ahead, and investors seem to be getting the message. Despite all the gloom out there, and despite all the disappointment, there is reason to be optimistic. If we've learned anything in the current recovery it's that 1) fiscal stimulus (e.g., the ARRA) doesn't work and 2) monetary stimulus (e.g., QE and zero interest rates) don't work either. Government policymakers cannot conjure up prosperity by spending more money or cutting interest rates. What's needed is for government to get out of the way and boost incentives for the private sector to jump-start the economy. That means lowering marginal tax rates, simplifying tax codes, eliminating subsidies, and reducing regulatory burdens. This is not rocket science. The entire world has witnessed massive, almost laboratory-type experiments in fiscal and monetary stimulus fail to deliver the promised results. There's nothing left to try except what is most likely to work. Politicians need to hand the reins over to the private sector and market forces and step aside. The world's stock markets seem to be saying that this is a real possibility that may come to fruition within the foreseeable future. Yesterday's post focused on the market's current inflation expectations for the next 5 and 10 years, as embedded in the pricing of TIPS and Treasuries. It concluded that inflation expectations are not unreasonable, and they are in line with past inflation and what is reasonable to expect going forward. This post focuses on how well the bond market's inflation-forecasting skills have proven to be. Conclusion: the bond market has more often than not tended to underestimate future inflation. For the first 12 years of the existence of TIPS, 5-yr breakeven inflation rates were lower than inflation turned out to be about two thirds of the time, and there have been some sizable errors at times. Introduction for neophytes: "TIPS" is an acronym for Treasury Inflation Protected Securities. TIPS were introduced in early 1997. They are a unique type of bond, because they pay a fixed, "real" rate of interest plus a rate that is equal to whatever inflation happens to be. The effective interest rate a TIPS investor receives thus has a real component (known in advance) and an inflation component, and both are guaranteed by the U.S. government. In practice, TIPS work like this (in simplified fashion): they are issued with a par value of $100, and that value is subsequently increased by the rate of consumer price inflation. They are also issued with a fixed coupon that is paid on the inflation-adjusted principal. Say you buy some 5-yr TIPS on January 1st with a fixed coupon of 2% and a par value of $100. At the end of the year it turns out that the CPI has increased by 3%. You would then end up with a total return of a little over 5%: the principal value of your TIPS would be 102 at the end of the year, and you would be paid a coupon of 3% on that value: 1.02 * 1.03 = 1.0506, or 5.06%. The market price (not the par value) of TIPS once they are issued varies inversely with their real yield: if real yields increase, the market price declines, and vice versa. If you compare 5-yr TIPS to 5-yr Treasuries, you can easily determine the bond market's expected, or "breakeven" inflation rate. (Breakeven is the technical term, since that is the inflation rate that would make the return on holding 5-yr TIPS equal to the return on holding 5-yr Treasuries to maturity.) 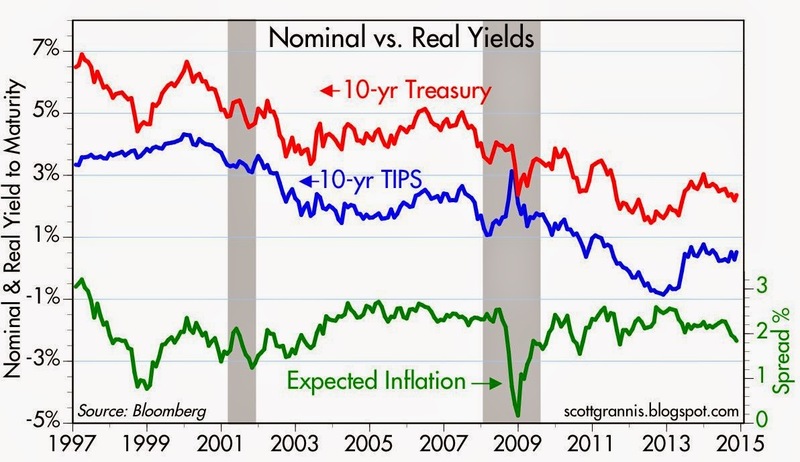 You simply subtract the real yield on 5-yr TIPS from the nominal yield on 5-yr Treasuries. The chart above compares the trailing 5-yr annualized rate of CPI inflation (red line) with the 5-yr breakeven inflation rate (i.e., the expected annualized rate of inflation over the subsequent 5 years) as predicted by 5-yr TIPS and Treasuries (blue line). Think of the blue line today as the market's inflation forecast made 5 years ago. For example: 5-yr TIPS first started trading in July 1997, when the breakeven or expected inflation rate for the next 5 years was 2.3%. The starting value for the blue line is thus 2.3% in July 2002, five years after their first issuance. In their first month of trading, the 5-yr breakeven inflation rate embedded in TIPS prices turned out to be exactly right, since the CPI rose at an annualized rate of 2.3% for the 5 years ending July 2002. As you can see from the chart, the blue line was almost always lower than the red line from 2002 through 2009. That means that the breakeven or expected inflation rate embedded in the pricing of TIPS and Treasuries was almost always lower than actual inflation turned out to be, and by a considerable amount, during the 7-yr period from 1997 through 2004. But from late 2004 through late 2007 (2009 through 2012 on the chart), the expected inflation rate tended to be somewhat higher than actual inflation, and the errors were of much smaller magnitude. Since mid-2008 (mid-2013 on the chart), the bond market's expected rate of inflation proved again to be much higher than actual rate of inflation. In general terms, TIPS have under-estimated inflation for 8 of their first 12 years of trading, and over-estimated inflation for four of the first 12 years. I note also that there have been times in the past where Treasuries and TIPS have egregiously under-estimated inflation. In late 1998, for example, (late 2003 on the chart) the expected rate of inflation over the next 5 years was about 0.6%, but actual inflation turned out to be about 2.5%. In late 2001, the expected rate of inflation was about 0.8%, but actual inflation turned out to be about 2.6%. In late 2009, the expected rate of inflation was about -0.4%, but actual inflation over the subsequent 5 years turned out to be 2%. I think there's a reasonable explanation for why the bond market has at times underestimated future inflation by a considerable amount. 1998, 2001, and 2009 were all times of great distress in the markets: the Russian default and LT Capital debacle in 1998, the recession of 2001, and the financial crisis of 2009. During times of great uncertainty, Treasury prices have been bid up to unrealistically high levels due to the market's craving for certainty; this pushed Treasury yields down relative to TIPS yields. Today, 5-yr TIPS and Treasuries are predicting that inflation over the next 5 years is going to be about 1.6% per year (the last datapoint for the blue line). Since 1966, inflation over any rolling 5-yr period has only been that low or lower for seven months—from April 2013 through October 2013—and that period was dominated by the negative rates of inflation we saw in 2009. In short, the U.S. bond market currently is expecting inflation to be historically low for the next five years. Since TIPS were first issued in 1997, the bond market has had a strong tendency to underestimate future inflation, especially during periods of rising inflation and during periods of financial market stress. Although the current expected rate of inflation is consistent with what we have seen in recent years and consistent with the significant decline in energy prices over the past six months, the market is arguably still afflicted with a substantial amount of risk aversion, as I've noted repeatedly. And it would appear that the bond market does not see hardly any chance that the Fed commits an inflationary error as it unwinds QE and moves away from zero-bound interest rates. The bond market could be right about the future of inflation, but it's making some pretty heroic assumptions, and past experience suggests it's probably underestimating future inflation today. The minutes of the October 2014 FOMC meeting released today showed that policy makers "should remain attentive to evidence of a possible downward shift in longer-term inflation expectations." Members also worried that "if such an outcome [a downward shift of inflation expectations] occurred, it would be even more worrisome if growth faltered." The charts that follow illustrate the market's inflation expectations as implied by the pricing of TIPS and Treasury notes and bonds. 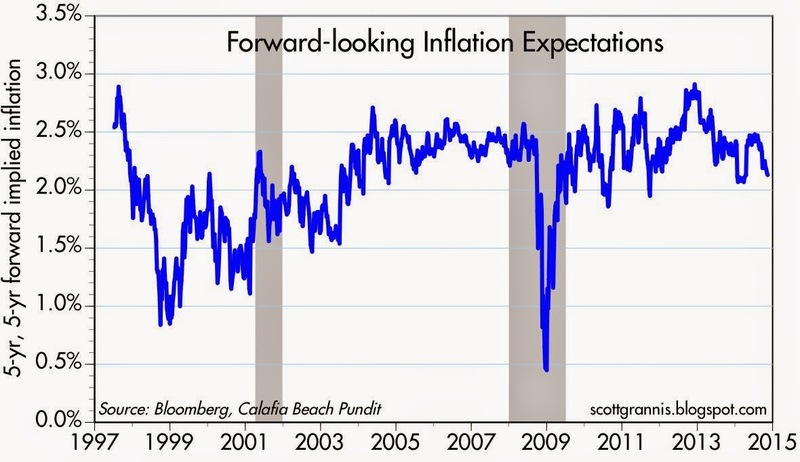 They all show that although inflation expectations have declined somewhat of late, they are not unusually low. It's notable that inflation and inflation expectations have remained solidly above 1-1.5% for the past 5 years, despite this being the slowest recovery on record—that suggests that the Fed's concern about slow growth leading to deflation are overblown. It's also notable that inflation hasn't been a lot higher despite the Fed's unprecedented experiment with massive Quantitative Easing—that suggests that the Fed hasn't really been printing money, but rather just supplying the world with risk-free assets (i.e., bank reserves) that have been in high demand. 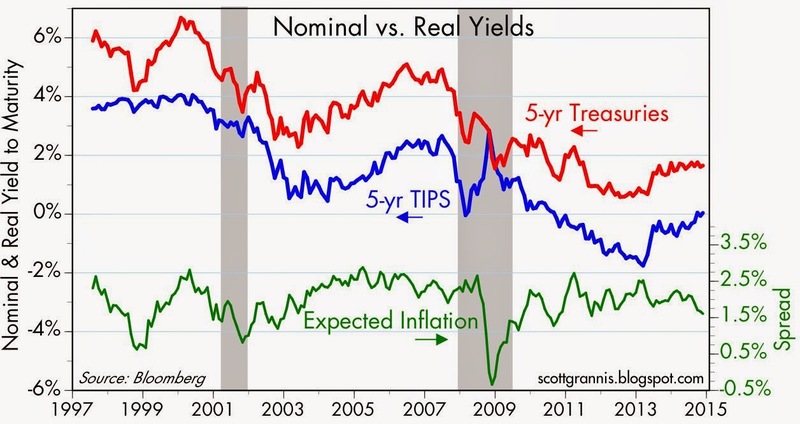 The chart above compares the nominal yield on 5-yr Treasuries with the real yield on 5-yr TIPS. The difference between the two (the green line on the chart) is the market's expected average annual inflation rate (CPI) over the next 5 years, which is currently about 1.6% That is lower than the 2.3% average inflation rate we've had over the past 10 years, but it is consistent with the fact that oil prices have fallen by about 30% in recent months and CPI inflation ex-energy has been running 1.5-2% for the past few years. With big declines in gasoline prices we should expect to see headline inflation fall somewhat. Moreover, there's no reason for the Fed to worry about a somewhat lower rate of inflation that is the by-product of falling energy prices, since cheaper energy should bolster economic growth. In short, I don't see anything to be concerned about on the inflation or monetary policy front at the present time. The chart above shows the 10-yr version of the first chart, and the green line represents the market's expected average annual CPI inflation rate over the next 10 years, which is currently about 1.8%. That too is consistent with our inflation experience in recent years and the behavior of energy prices. The chart above effectively links the first two. It shows the implied forward-looking inflation rate five years from now (i.e., what the average annual inflation rate is expected to be from 2019 through 2024). For years 1-5, as the first chart shows, inflation is expected to be about 1.6% a year. For years 6-10, as the second chart shows, inflation is expected to be faster, about 2.2% per year. Over the next 10 years, inflation is expected to average 1.8%. That's just fine in my book, although I'd be a little happier if inflation were closer to zero. Low and stable inflation is nirvana for supply-siders, since it fosters confidence, facilitates long-term planning (which in turn boosts investment and productivity gains), and minimizes the world's need to spend time and money looking for inflation hedges. Why the Fed is so fixated on inflation being 2% instead of 1% is a mystery that can only be explained (possibly) by the Fed bowing to the current "wisdom" that low inflation exposes the economy to the "risk" of deflation. It may be politically expedient to extoll the risks of deflation, but there is no practical reason to do so. Deflation doesn't lead to slow growth, and deflation is not incompatible with strong growth. Nothing mysterious or scary about these numbers, in any event. 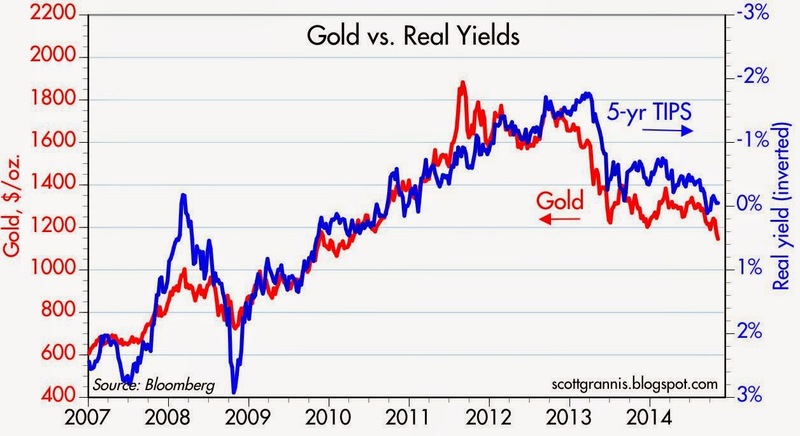 So what about falling commodity and gold prices? As I see it, commodities and gold are still trading well above the levels of 10-15 years ago. (see chart above) The next two charts look at gold and commodities in real terms, which I think is more relevant when considering whether commodity prices are likely to contribute to inflation or not. 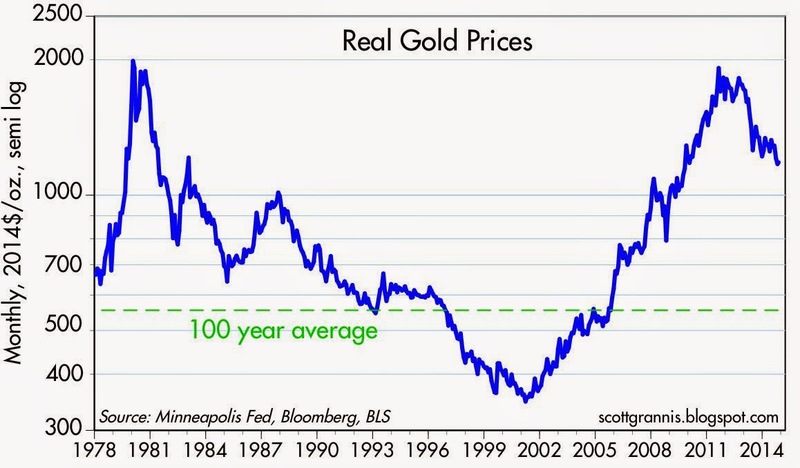 As the chart above shows, in real terms gold is still about double what it has averaged over the past century. Today's gold prices therefore reflect a substantial premium, which in my mind means that the market still worries a lot about the possibility of the Fed making an inflationary error in the future, and the possibility of geopolitical turmoil. Gold, in other words, is still priced to a substantial risk of something going wrong. But since gold has fallen from $1900 to $1200 in the past few years, it means that the market's concerns have been alleviated to some degree. That's good. It's not a harbinger of deflation, it's a sign that the risk of high inflation has gone down. 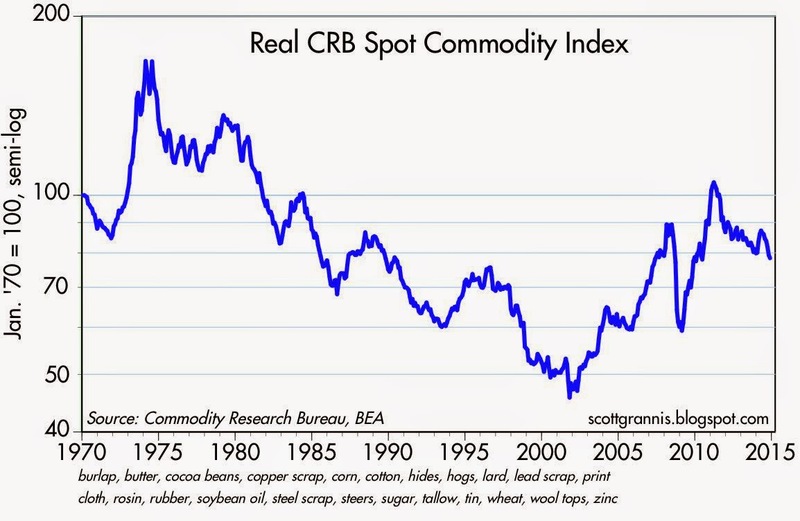 As the chart above shows, in real terms commodity prices today are about 10% below their 45-year average. They were really cheap in 2002, and that was a time when the dollar was very strong, gold was very weak, and deflation was a definite possibility. Today, commodity prices are only somewhat lower, relative to other things, than they have been for many decades. In my view, this means commodity prices today aren't likely to impact overall inflation by much, if any. All things considered, the near-term outlook for inflation is not worrisome at all. But I still worry that the Fed could be slow to raise short-term rates and/or withdraw excess reserves in a timely fashion should inflation begin to accelerate. In short, for now things look OK, but I still think the risk of higher inflation down the road is more worrisome than the risk of deflation. All of this suggests that the Fed is unlikely to do anything that would shock the markets in the foreseeable future (e.g., the next 3-6 months). A newly-released study by the Congressional Budget Office was designed to demonstrate that the inequality of income distribution in the U.S. has declined in recent years, thanks to increased transfer payments and higher tax rates on the rich. 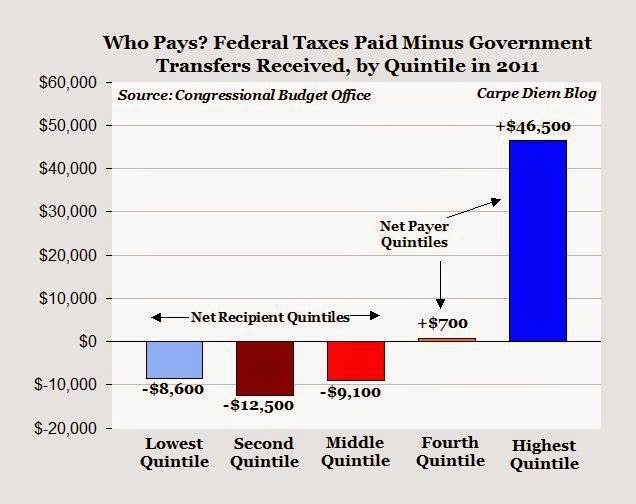 As Mark Perry notes, "Almost half of the income inequality between the highest and lowest household quintiles disappears when we adjust for government transfer payments and federal taxes. Before taxes and transfers, the average income of a household in the top 20% is 15.1 times greater than the income of a household in the lowest quintile, but that ratio drops to only 7.8 times after adjusting for transfers and taxes." Reasonable people can disagree about whether a reduction in inequality achieved in this manner is a good thing or not (I'm in the disagree camp). In any case, the U.S. income tax code remains highly progressive, especially when one factors in the effects of income redistribution. 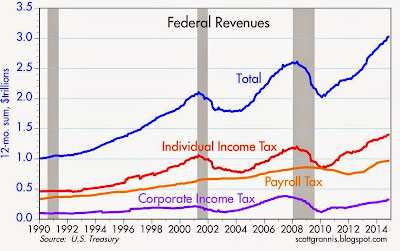 That's illustrated in the chart above, which shows the percentage of total federal taxes paid divided by a comprehensive measure of income which includes labor income, business income, capital gains realizations, dividend income, and retirement income, plus all government transfer payments. The bottom one-fifth of income earners pay an average federal tax rate of only 2%, whereas the top 1% face an average federal tax rate of almost 30%. It's much worse in states like California, where top income earners also face a state income tax rate of 13.3%. Moreover, rates in the charts above for "the rich" would be higher today, thanks to a new top federal income tax rate of 39.6%, and an additional medicare tax of 0.9% for couples earning over $250K. 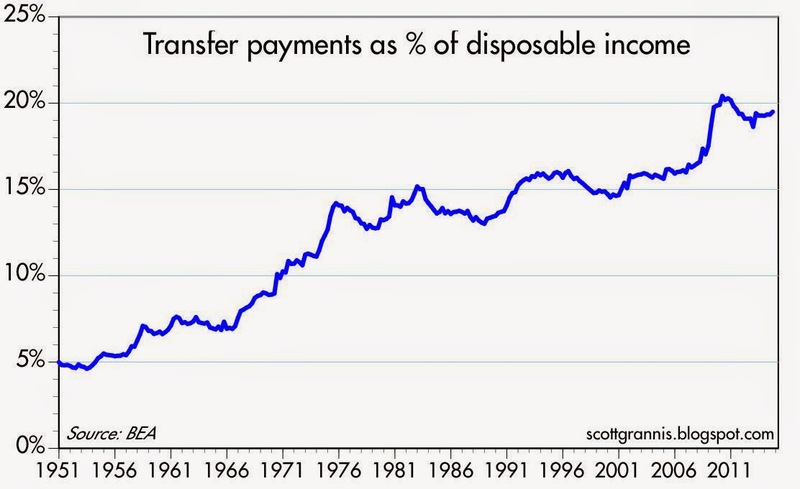 Mark also notes that because of the relatively high level of transfer payments these days (which are now at all-time highs relative to disposable income), well over half of all taxpayers receive more in transfer payments from government sources than they pay in taxes. That's illustrated in the chart above, where each bar represents the average household income in each quintile minus government transfers received. Furthermore, Mark notes that "the top 20% of American “net payer” households finance 100% of the transfer payments to the bottom 60%, as well as almost 100% of the tax revenue collected to run the federal government." The chart above tells the same story, even though it is more narrowly focused, since it excludes employment taxes, business income, and transfer payments. 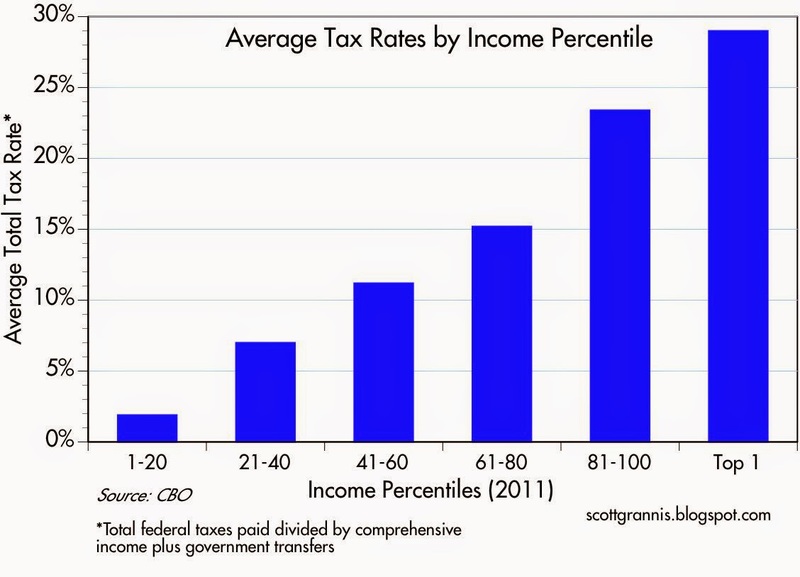 It looks only at the percent of total federal income taxes paid by the 25% of income earners. Here we see that the top 25% of income earners pay almost 90% of federal income taxes. How can anyone argue that the rich aren't paying their fair share? A great majority of the people are net recipients of the money paid by a relatively small majority. If anything, we have a potentially destabilizing situation, in which a large majority receive much more from the government than they pay in, and they can vote themselves still more of the money earned by a small minority. That's a classic "tyranny of the majority." Supply-siders have argued for years that the steeply progressive U.S. tax code, with its myriad deductions, transfers, and subsidies, is extremely inefficient, and anti-growth. It's a major headwind to economic progress, and it most likely hurts the very people it's purportedly designed to benefit: the middle class. Why? Because the U.S. economy is arguably missing out on some $2 trillion each year in income—most of which would likely accrue to the middle class—because of, among other things, very high marginal tax rates and extremely burdensome regulations that discourage work and inhibit new business formation. According to the Co-Star Group, the commercial real estate market is doing extremely well. 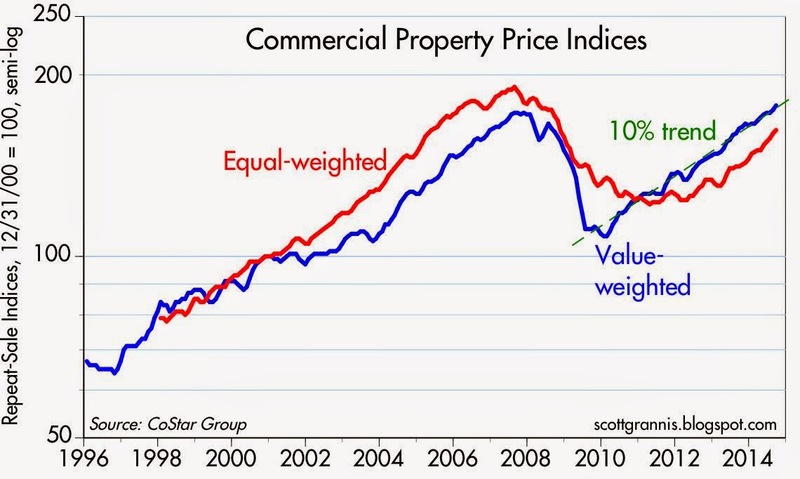 As the chart above shows, a value-weighted measure of commercial property price indices has risen at a 10% annualized pace for the five years ended September 2014, and prices now exceed their pre-recession high. An equal-weighted measure is up over 14% in the past year. Both the value-weighted and the equal-weighted U.S. Composite Indices of the CCRSI made strong gains in September 2014 to close the quarter. The value-weighted index, which is heavily influenced by core transactions, advanced by 1.9% in the month of September and 3.3% in the third quarter of 2014. The value-weighted index is now 2.8% above its prerecession high and continues to make solid gains. The equal-weighted U.S. Composite Index, which is heavily influenced by smaller non-core deals, increased by 1.3% in September and 4.2% in the third quarter of 2014. PROPERTY SALES ACTIVITY EXPANDING QUICKLY. ANNUAL PRICE GAINS REALIZED ACROSS ALL MAJOR PROPERTY SECTORS. RETAIL PROPERTY SEES STRONGEST ANNUAL GAIN. MULTIFAMILY INDEX PASSES PREVIOUS PEAK. We may be in a sluggish recovery, but that does not mean that everything is sluggish. I note that since September 2009, the total return of the Vanguard REIT (VNQ) is an annualized 18.7%, almost two percentage points per year better than the annualized 16.8% total return of the S&P 500 index. Jonathan Gruber simply admits that the very process that people on the left romanticize and celebrate – democratic politics – isn’t what it’s cracked up to be. Of course, libertarians and public-choice scholars say the same. The difference between the Jonathan Grubers of the world and the Russ Robertses and Bryan Caplans of the world is that the former believe that politics is still commendable as long as good, smart people (such as Gruber) are performing deceptions necessary to trick voters into supporting policies that good, smart people somehow divine are best for the masses, while the latter believe that the very need to deceive rationally ignorant (indeed, rationally irrational) voters is itself a major flaw in politics – a flaw that makes politics far less reliable and admirable than competitive, private markets. In a nutshell, GruberGate reminds us why we would be better off with less government, and a greater reliance on free markets, especially in regards to healthcare. It wasn't too long ago that the federal budget deficit was projected to run into the trillions of dollars per year for as far as the eye could see, and that years of federal budget deficits in excess of 10% of GDP could end up destabilizing the world's largest economy. Fortunately, the future didn't turn out to be nearly as awful as many thought. 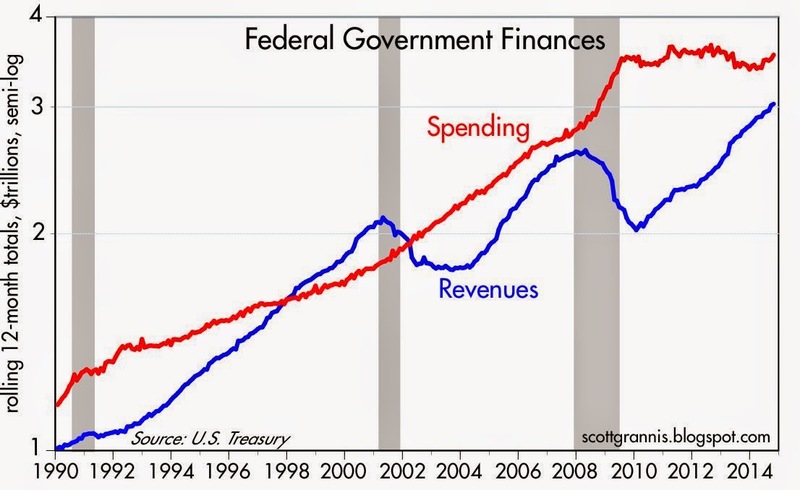 Federal spending has been essentially flat for the past 5 years, while federal revenues have increased by 50%. 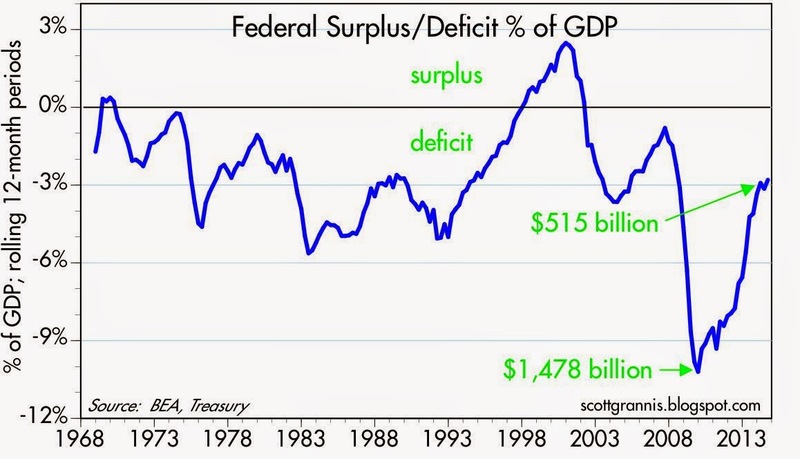 As a result, the deficit has collapsed by almost two thirds, and is now a mere 2.8% of GDP. As I mentioned in an earlier post this week, and as I've been reiterating for years, the future has turned out to be much better than the market's gloomy expectations, and that's an important reason why the stock market has done so well and continues to climb. Markets are moved when the unexpected happens. The October budget figures released today show continued gains in revenues, which have risen by fully 50% in the past 4-5 years. Most of this increase is due to an expansion of the tax base: more jobs, higher incomes, more capital gains, and more corporate profits. Higher tax rates can only account for a portion of these gains. 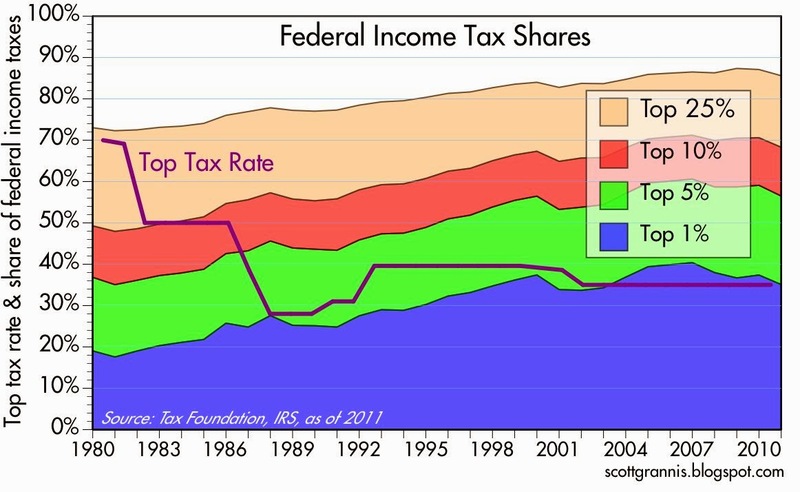 In fact, revenues might have been stronger had tax rates not been increased. Today's very high marginal tax rates are almost certainly contributing to the disappointingly slow recovery. 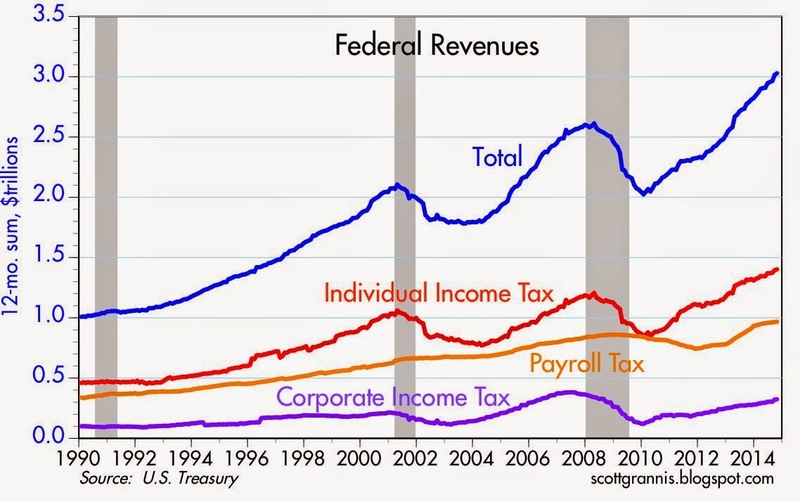 Income taxes and payroll taxes account for the lion's share (about 80%) of federal revenues. We could easily afford to slash or even eliminate corporate tax rates, and that would almost certainly result in more business investment, more jobs, higher incomes, higher capital gains taxes, higher dividend income, and perhaps not much (if any) of a net loss in total federal revenues. If we simply kept federal spending from increasing for another few years, the budget would be balanced and we'd all be happier. Except, of course, the politicians who love to buy votes by passing out other people's money. 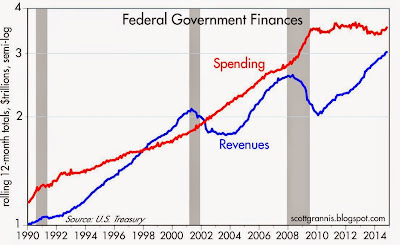 The chart above shows the dramatic turnaround in the federal budget deficit. 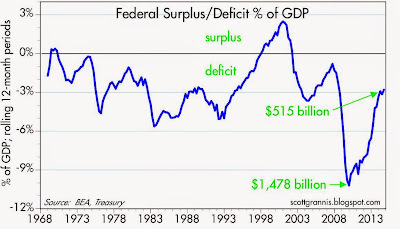 The current deficit is just under 3% of GDP, and that is not a problem at all. Barring a dramatic increase in spending and/or another recession, the deficit is likely to continue to decline for the next several years, both in nominal terms and relative to GDP. Looking ahead, I'd like to think that in the next few years a new Congress is likely to pass a variety of pro-growth policies that help unlock the economy's full potential. Already it seems that the Keystone Pipeline is likely to pass, with many Democrats, led by Mary Landrieu, deserting the White House's opposition to it. Obama's vow to veto legislation he doesn't like may turn out to be as resolute as the various lines in the sand he drew in the Middle East. What is the tune? It's a mix of declining risk aversion, rising confidence, less uncertainty, and continued growth. That's not to say that everything is just peachy. Rather, it is the result of things turning out somewhat better than the market's gloomy expectations. This tune has repeated in dozens of blog posts here over the past 5 years. The dollar is rising because the outlook for the U.S. economy is improving, and the U.S. economy is doing better than most other developed economies, and that in turn inspires confidence where before there was despair. Gold is falling because inflation remains under control, the dollar is strengthening, and civilization as we know it remains intact; gold had been priced to all sorts of calamities (e.g., massive monetization of debt, a collapsing dollar, geopolitical turmoil, double dip recessions) which have failed to materialize. Commodities are falling because the dollar is rising, and because commodity prices had risen to such a degree that increased exploration and production kicked in. Bond yields, particular the real yield on 5-yr TIPS are rising, as the market gains more confidence in the economy's ability to grow, and as investors become less risk averse—unwilling to accept negative real yields in exchange for protection against rising inflation and a slumping economy. Rising real yields and falling gold prices tell us that the world's demand for safe assets is declining, because risk aversion is declining and confidence is rising. The prices of gold and 5-yr TIPS have been moving in unison for many years (I use the inverted real yield on TIPS as a proxy for their price). Both are "safe" assets in the sense that they offer protection against certain kinds of risk. Gold is a traditional safe harbor for those who worry about currency debasement and geopolitical risk. TIPS are guaranteed by the U.S. government, and they offer explicit protection against inflation. Moreover, they are the only instrument that can promise a guaranteed real rate of return. Gold has declined from a high of $1900/oz to now just under $1200. It's still trading way above its long-term, inflation-adjusted price of about $600, so it's still "expensive," only less so now that it was a few years ago. Real yields on 5-yr TIPS are about zero, which means investors are willing to give up any hope of a real rate of return in order to be compensated for inflation. 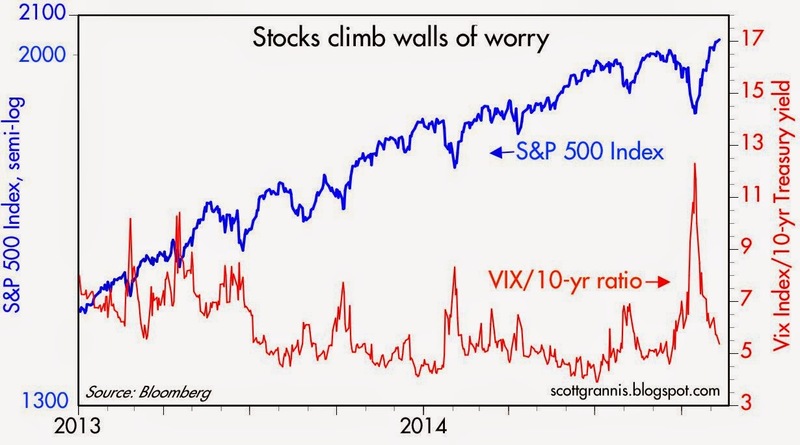 This tells me that the market is still quite risk averse, only less so than it was a few years ago. Declining prices of gold and TIPS are a direct indication of declining risk aversion and rising confidence. 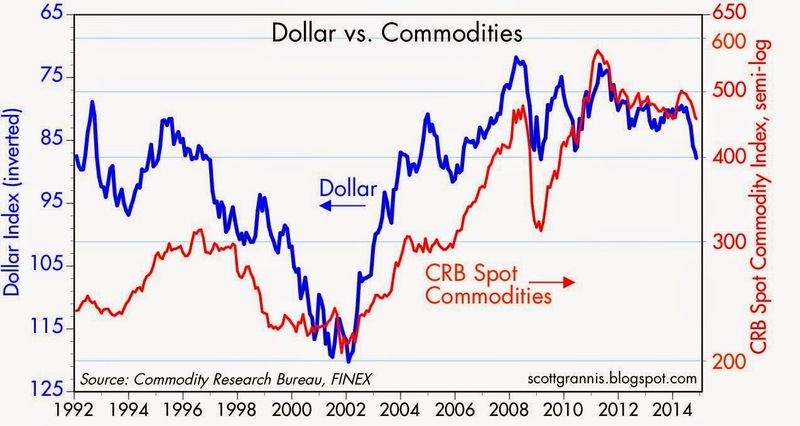 The dollar and commodity prices have been negatively correlated for a long time. Commodities are a proxy for real (tangible) assets that tend to preserve their value in times of currency weakness (as is gold). So when the dollar weakens, commodities (and gold) tend to strengthen. Recent dollar strength has contributed to a moderate decline in commodity prices, and as the chart suggests, commodities may continue to soften. But they are still well above the levels of 13 years ago, and the dollar is still well below its former highs. 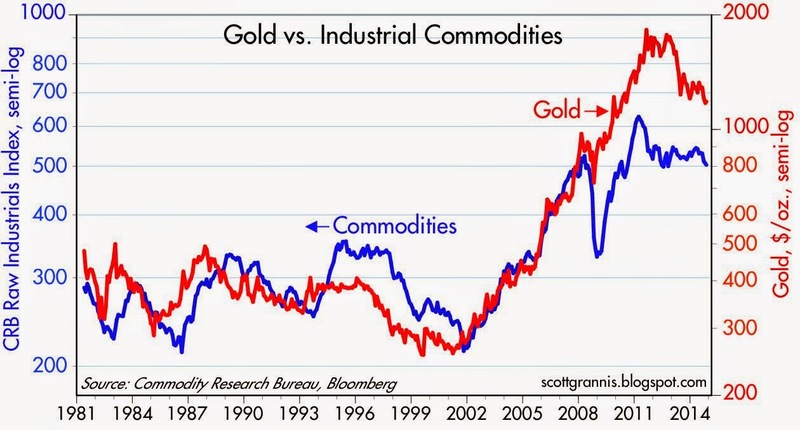 Gold and commodity prices have been positively correlated for decades. But gold tends to be much more volatile: note that the range gold prices (the right y-axis) is about about 2 ½ times the range of commodity prices (left y-axis). Gold "overshot" commodity prices a few years ago, and has been gradually coming back into line with commodities. This suggests to me that gold could decline to $900/oz or a bit less over the next year or two. The ratio of the Vix index to 10-yr Treasury yields (the red line in the above chart) is a good measure of the market's fear, uncertainty and doubt regarding the future of the U.S. economy. Bouts of fear have been the driving force between stock market corrections, not any actual weakness in the economy. But the market is still somewhat nervous and cautious. 10-yr yields are still very low, which tells me that the market does not believe the economy can grow much faster than it has in recent years (2 - 2.5%), and is more at risk of slowing down, than speeding up. 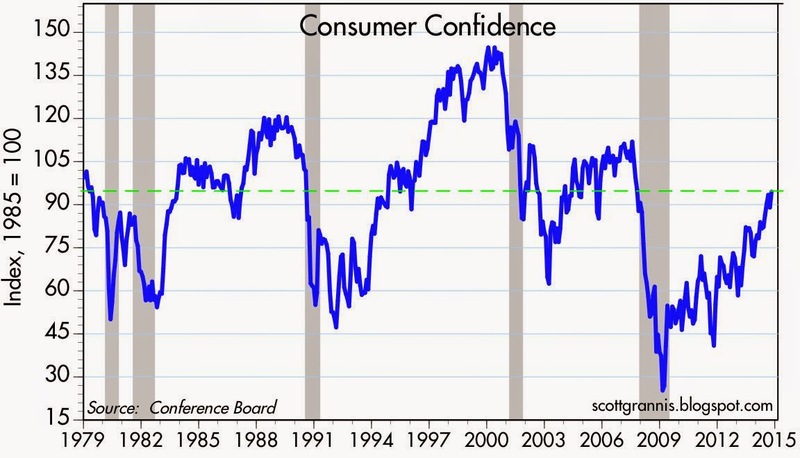 This chart of consumer confidence sums things up nicely. Confidence has been rising for the past five years, but it is only now about equal to its long-term average. Conditions have improved, but it's hard to find evidence of exuberance. Consumers are still concerned about the health of the economy. The recent elections confirm that people are unhappy with the way things are going. The economy could be a lot stronger, and incomes could be a lot higher, if only government would get out of the way. UPDATE: I should have included the chart below before. It also confirms what is going on. PE ratios are up from very low levels (a sign of a great lack of confidence in future earnings), but they are only slightly higher than average. There is no sign as yet of any "irrational exuberance." Stocks are doing well because earnings are doing very well and investors are gradually regaining their confidence in the future. 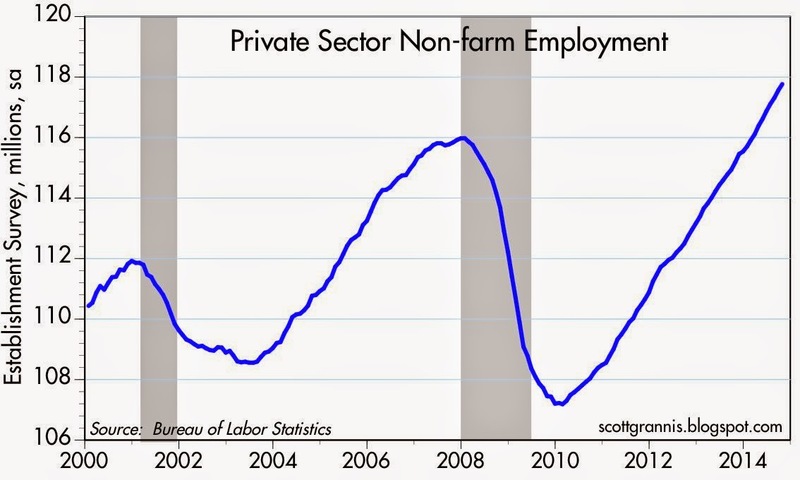 If there's anything remarkable about the private sector jobs market (the only one that really counts, since the public sector is far less efficient), it is the under-appreciated fact that it has been growing at a relatively steady pace of just over 2% per year for the past four years. That's as fast as it grew in the prior business expansion (2002-2007), but that pace of growth lasted only three years. So in at least one important aspect, this recovery has actually been better than the last. The big difference between the two, of course, is the labor force participation rate: there are upwards of 10 million people who have dropped out of the workforce. 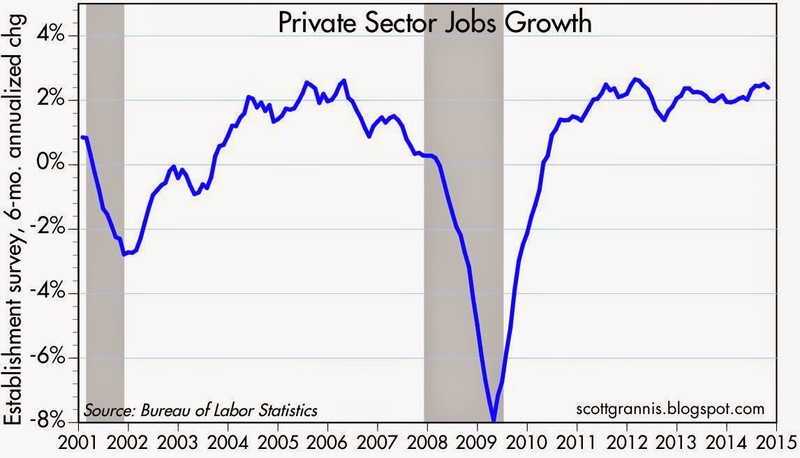 The economy has been adding jobs at a decent rate, but from a lower base. The current recovery boasts four years of jobs growth exceeding 2%. In the prior one, there were only three years. The labor force grew at just over 1% for many decades until growth virtually ceased starting in 2009. There's been only a very slight uptick in growth in recent years. Despite four years of over 2% growth in private sector jobs, total employment today is only marginally higher today than it was at the peak of the last expansion. 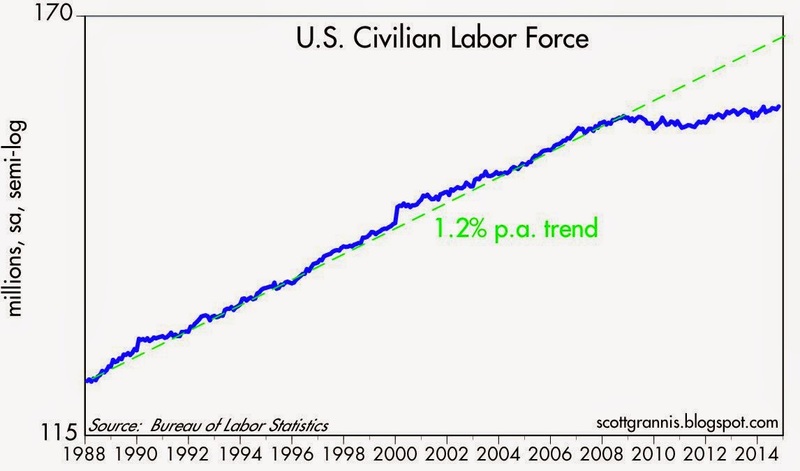 If this had been a normal recovery there would be at least 10 million more people working. That adds up to an annual income shortfall of about $2 trillion. The big question is whether this picture will change if the Fed continues to keep short-term interest rates extremely low. I for one fail to see how low interest rates will cause the economy to add jobs at a faster rate than it has managed for the past decade, or how low interest rates will encourage 10 million people to start looking for jobs again. I think the underlying problem is not interest rates or monetary policy. We've created numerous barriers to re-entry to the labor force: transfer payments are at all-time highs relative to disposable income; and marginal tax rates for those receiving government assistance are extremely high (for many, the decision to work would mean the loss of benefits and less disposable income). And there are barriers to jobs creation as well: marginal tax rates on capital are higher than they have been for decades; and regulatory burdens have never been so heavy. In short, the economy still faces a nmber of significant headwinds which will not diminish just because interest rates are low. So the fix needs to come from Congress, not from the Federal Reserve. I'm optimistic that Congress will manage to convince Obama to accept at least a few pro-growth changes in coming years. 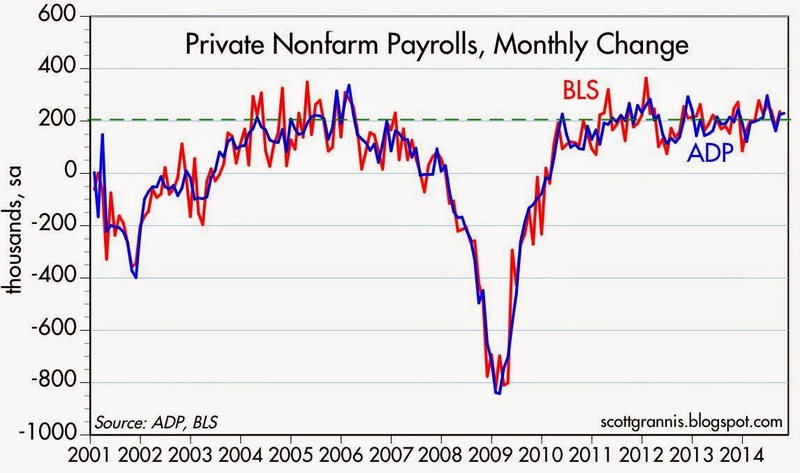 Today's October ADP private sector payroll report didn't change the economic outlook, but I still think the economic fundamentals are gradually improving. Job growth, as estimated by ADP, was marginally higher than expected (+230K vs. +220K), but as the chart above shows, that's within the range of what we have seen for the past several years. We would need to see numbers of +250-300K or more before getting really excited about a stronger economy. 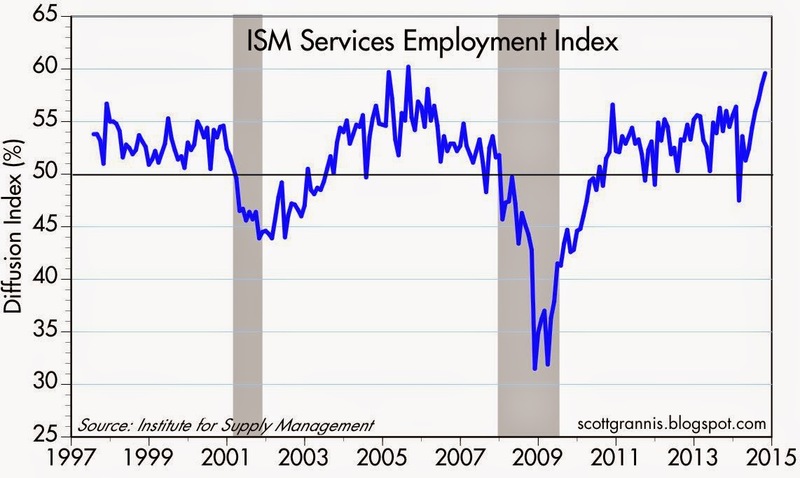 The October ISM service sector report (first chart above) was OK, but the employment subindex (second above) was the highlight: a significant gain, of the sort we rarely see. This speaks to an improving level of confidence in the future, and that is one ingredient that has been sorely lacking in this recovery. 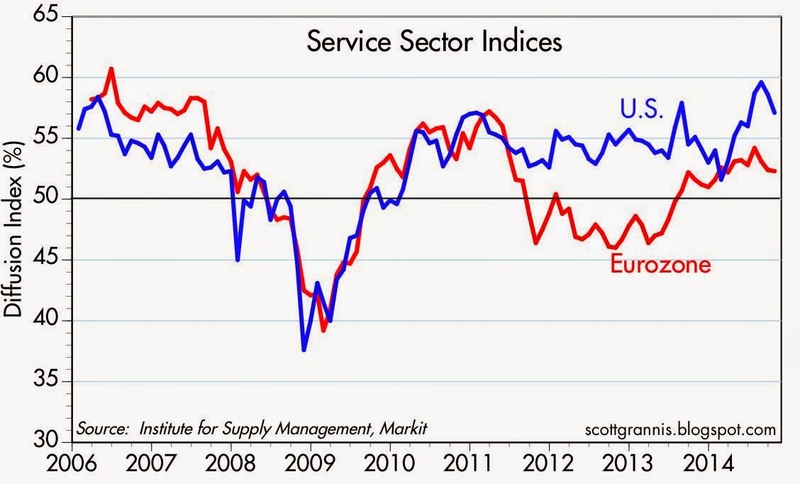 As the third chart shows, the U.S. service sector continues to outpace that of the Eurozone, but neither one shows any meaningful deterioration. Nevertheless, even relatively lackluster numbers like these carry an important measure for investors who are uneasy about holding cash: as long as the economy avoids recession and continues to grow, risk assets are likely to outperform cash since they carry yields which are significantly better than the zero yield on cash. Meanwhile, yesterday's election results offer real hope for the future. The so-called Republican "wave" was not only a repudiation of Obama's liberal agenda and his anti-growth policies (e.g., Dodd-Frank, Obamacare, anti-carbon agenda), but also of his failed leadership and his aversion to bipartisan reform. If anything is to get done in the next two years, it will need to have bipartisan support. I'm pretty sure the Republicans understand that, and Obama will find it hard to veto bills which represent the newly expressed will of the country. At the very least, a Congress at odds with the President means that federal spending is likely to remain subdued; taxes are highly unlikely to rise (the current burden of taxation is intolerable, but it surely is not going to get worse); there is a decent chance of some reductions in tax rates (especially for businesses) accompanied by some simplification of the tax code; and some growth-oriented measures (e.g., Keystone pipeline approval, market-based reforms of healthcare, reductions in employer mandates) have a good chance of passing. Any or all of these would act to convert headwinds into tailwinds, restore confidence, and boost optimism. A Republican Congress could be the best thing to happen to Obama's otherwise failed presidency. Speaking of confidence, the ongoing decline in the price of gold confirms that the world is becoming less risk averse and gradually more confident. The declining price of 5-yr TIPS (using the inverse of their real yield as a proxy for their price) also reflects less risk aversion. These are very important indicators to watch. Further declines in gold and TIPS prices would bolster the bull case for markets and the economy. One way to think about the value of the dollar is that it's like the price of admission to the U.S. economy. The more attractive the economy looks, the more a ticket ought to cost. That's what is happening to the dollar today, because on at least a few fronts, the outlook for the U.S. economy is improving. According to the Institute for Supply Management's October manufacturing survey, the economy's growth rate may finally be ramping up a bit from the sluggish 2.3% which has prevailed for most of the past five years. 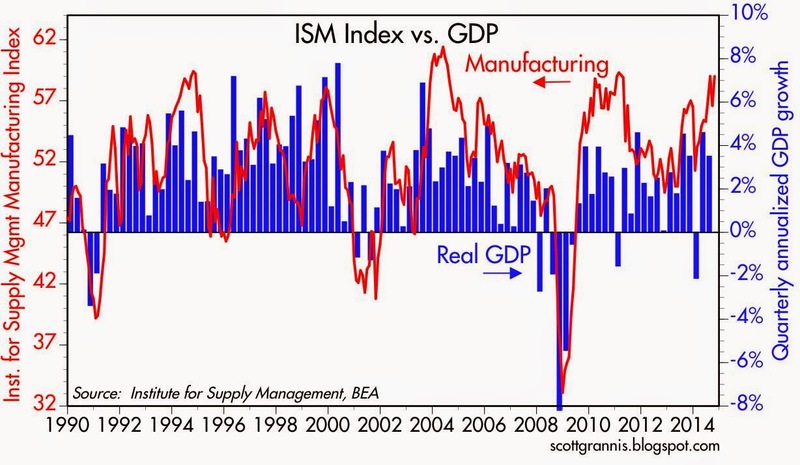 The October ISM manufacturing survey was stronger than expected (59 vs. 56.1), and as the chart above suggests, that is fully consistent with overall GDP growth of at least 3-4% in the current quarter. 4% is probably too much to hope for, but 3-3.5% would be a good deal better than what we've seen so far in this business cycle expansion. 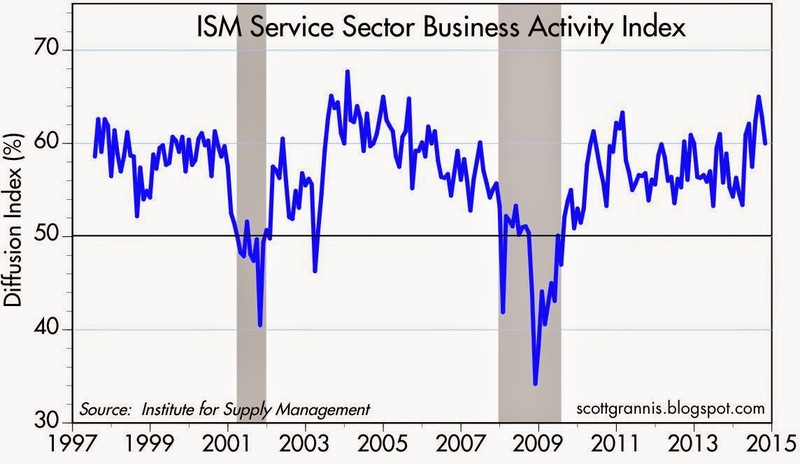 The New Orders subindex of the ISM survey was especially strong. As the chart above shows, it has only been stronger about a half dozen times in the past 15 years. 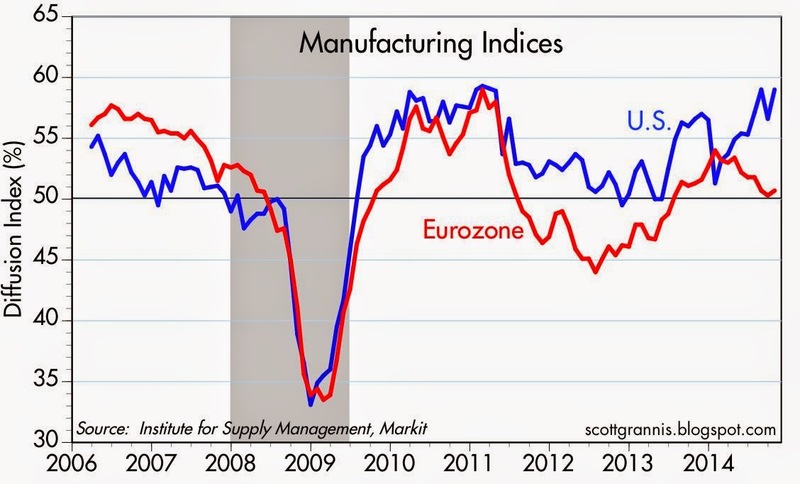 Manufacturing conditions are clearly much better in the U.S. than in the Eurozone, as the chart above shows. 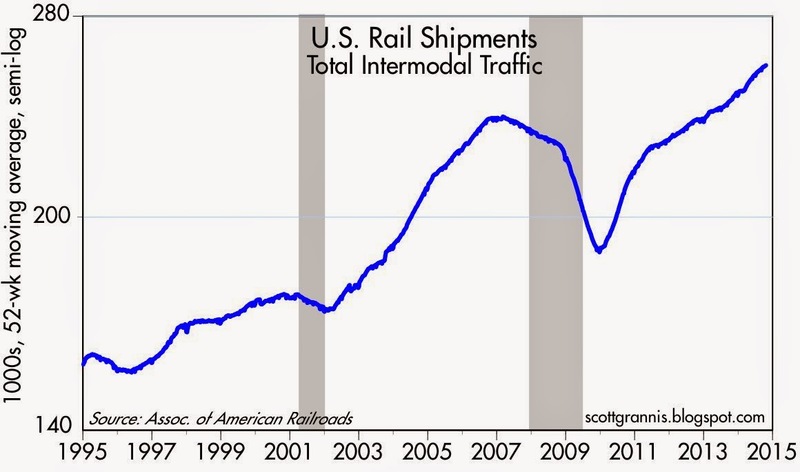 As the chart above shows, the 52-week moving average of container shipments via railroad is up a strong 6% in the past year, and has clearly surpassed the pre-recession high. This is physical and very real sign of increased economic activity. In a similar vein, the physical amount of goods hauled around the country by trucks (truck tonnage) hit an all-time high in September, up 3.75% in the past year. As the chart above shows, this is fully consistent with the improvement we have seen in equity prices. A growing economy naturally leads to rising equity valuations over time. In inflation-adjusted terms, in the past three years the dollar has gained almost 20% against other major currencies. 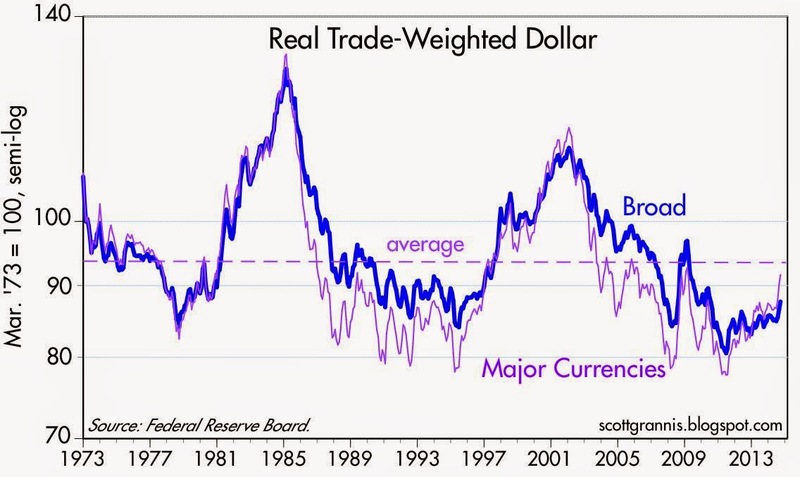 But as the chart above shows, that still leaves the dollar below its long-term average value. The dollar is still somewhat weak, from a long-term perspective, but it has regained a considerable amount of its former value in. 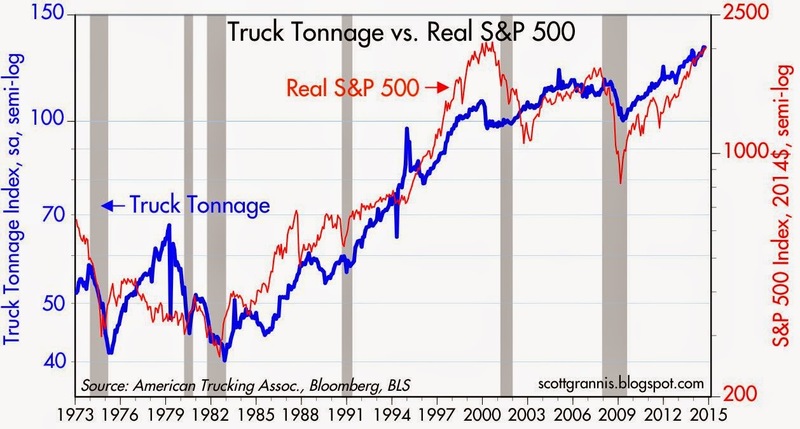 This confirms the good news that we are seeing in the manufacturing, rail, and trucking sectors. A stronger dollar will help keep inflation low, and at the same time it tells us that the world is now more disposed to invest here. Stronger investment flows will help strengthen the U.S. economy in the years to come—it's a welcome and virtuous cycle.